Integrity and trust in medicine are vital. What other profession is granted the awesome responsibility of caring for a fellow human's life? In what other field do people allow a stranger to listen to their most intimate secrets, examine their bodies, or care for people's most cherished possessions, their children? Likewise, trust in communications that occur between physicians on a patient's behalf are equally important. Only through the implicit values of integrity and trust would patients allow us to do what we do when managing their care. Clinical medicine has no room for lies, half-truths, or deception. Yet for nearly twenty-five years, I believe the American Board of Internal Medicine (ABIM) has been involved in a massive financial cover-up involving the redistribution of physician testing fees. Why does it matter whether physicians are safe placing their trust in the ABIM? Because if the ABIM physician credentialing standards are corrupt, then standards for quality metrics contained in modifications to Social Security Law 1848 made by the Affordable Care Act, hospital credentialing rules requiring Board re-certification by the ABIM, and insurance physician payment rules are also corrupt. I will say at the outset that I do not think that most of the physicians and staff who work at or for the ABIM are bad people. I suspect many of them have the highest of integrity and trustworthiness as any physician. For instance, on 10 Feb 2015 in response to the growing re-certification controversy, Jim Stackhouse, MD, a former member of the Board of Regents of the American College of Physicians (ACP) left a blog comment to the current Chairman of Board of Regents of the ACP, Robert Centor, MD that described his efforts to challenge the status quo before he resigned from the Board. It is also likely that the financial actions of this organization were not disclosed to all. But I am also not so naive to believe that certain members of ABIM worked in isolation from other professional societies and organizations. The intricate use of non-profit organizations and regulations present here is simply not the domain of most straight-forward practicing physicians. "... the Board took the bulk of its reserves (about $55 million, when all the contributions are added up) and placed them in a Foundation, whose charge was to support the Board’s work and serve the broader medical community. This is a standard practice for most large societies and accrediting organizations. The accounting involved is completely legitimate and has been vetted by yearly audits conducted by national accounting firms." It is possible that the ABIM's financial actions have been perfectly legal. After all, I am a practicing physician with limits to my time, not a lawyer or accountant specializing in non-profit tax law. But this fact is clear: until yesterday's explanation by Dr. Wachter, the ABIM has consistently and repeatedly denied the existence of their Foundation to the public, the Internal Revenue Service, and practicing physicians between 1989 and 1999 and by doing so, I believe the ABIM's actions in regard to board re-certification have been deceptive, discriminatory and have violated the integrity and trust of the public and our profession. I intend to show using the ABIM's own documents, archived and current web pages, literature review, scoring data, tax records for the ABIM and ABIM Foundation from 1997 to present and public record (all heavily linked here) why I feel this way. The American Board of Internal Medicine is a physician-led 501(c)(3) tax-exempt independent organization that derives 98% of its revenues from physician testing fees and was founded in Des Moines, Iowa in 1936. Originally Board certification served as a marketing tool for independent physicians eager to grow their practice. Obtaining a Board certificate established a baseline level of competence to practice in one's field allowing physicians who trained at lesser-known medical training programs to establish their credibility against doctors from more well-known training programs. Like the Bar examination for the legal profession, the Board certification examination was a rite of passage for establishing credibility amongst the physician community that a physician had obtained a certain level of medical knowledge adequate for patient care. Originally, the secure examination for Board certification was performed once and considered a valid credential for a physician's lifetime. The backdrop of medicine was very different when this story began. Cell phones had not been invented, the World Wide Web as we know it was just coming of age, communication was comparatively slow, and the majority of physicians were in independent practices outside of hospital employment. There was already a wide divide in medicine between the entrepreneurial private practice physician community and academic physicians who enjoyed the protected time and prestige of the academic environment, usually at a lower salary. But not all academic physicians suffered financially due to lucrative speaking arrangements and consulting fees. For a very select chosen few, the "academic elite," the non-profit world was especially enticing because it provided shelter from the demands of "publish or perish" with promises of mahogany desks, first-class air fares, fancy hotel venues and prime consultant positions as they entered the bureaucratic sphere of public policy and academe. One only has to view the American Medical Association's corporate headquarters in downtown Chicago to understand the potential revenue involved in such a career path. In 1986, after two decades of “discussion and debate,” the American Board of Internal Medicine (ABIM) board decided to limit the validity for all Board certificates to ten years. The rationale for this change was: “The rapidly changing scope of medical information, evidence that the knowledge and skills of practicing specialists decline with time, and growing public concern over the need to periodically re-credential physicians were the major determinants in the Board's decision.” Nowhere did the ABIM mention the significant financial benefits to the organization inherent to this policy change. Board re-certification was also a concept unique to US medicine; while the US and other countries require continuing medical education, no other country in the world requires their physicians to repeatedly re-certify in their specialty. The re-certification policy became effective in 1987 for critical care medicine, 1988 for geriatric medicine, and 1990 for certificates in internal medicine, each of the subspecialties in internal medicine, and all other added qualifications. At that time, certificates in internal medicine or a subspecialty issued prior to 1990 were not time limited and, therefore, were valid for life. Individuals holding these certificates were encouraged (but not forced) to re-certify and could do so without placing their time-unlimited certificate at risk. In 1995, the ABIM launched their re-certification program called "Continuous Professional Development (CPD)" that involved a secure examination. The first CPD examination was administered to 306 physicians in 1996 and the overall pass rate was 93% with 8 of 12 internal medicine subspecialties having a 100% pass rate. (For comparison purposes, in 2014 (the most recent year examined) the number of re-certifying physicians had mushroomed to 11,371 physicians with a much lower 83% pass rate overall). In 1997 the Institute for Clinical Evaluation was created (Foundation fees funded this effort to the tune of about $3 million and were only disclosed on tax forms) with its initial aim to test physicians on their ECG-reading skills. Repeated testing of varying clinical skills was envisioned, but perhaps because of the work involved to test various clinical skills for all subspecialties, this new non-profit was later dissolved back into the Foundation in 2004 with Cristine Cassel, MD signing as the President of both organizations. In 2000, the ABIM announced the existence of the ABIM Foundation to the public on their website and launched their “Medical Professionalism Project” spearheaded by ABIM member Troy Brennan, MD, JD to define “medical professionalism.” The directors of the Foundation, the ABIM, American College of Physicians – American Society of Internal Medicine, Robert Wood Johnson Foundation, and the European Federation of Internal Medicine were responsible for the creation of the document. In 2002, a white paper entitled "Medical Professionalism in the New Millenium" was simultaneously published without peer review in the Annals of Internal Medicine and The Lancet. The paper centered on three fundamental principles that the authors felt defined “medical professionalism:” (1) the primacy of patient welfare, (2) patient autonomy, and (3) the principle of social justice – that is, “the medical profession must promote justice in the health care system, including the fair distribution of health care resources” (emphasis mine). As part of this social justice imperative, the hard-to-disagree-with Choosing Wisely® program was later launched, but the source of funds for the Foundation or Choosing Wisely® was never disclosed publicly. In 2005, the ABIM website announced its affiliation as a member board of the American Board of Medical Specialties (ABMS) - a 501(c)(6) organization that is now comprised of some twenty-four subspecialty member boards across all disciplines of medicine and includes the ABIM. The ABMS had more monopolistic control of the re-certification process across the various disciples in medicine and could more heavily lobby Congress on behalf of physicians with its less restrictive tax-exempt status. With their announcement, the ABIM began using the more complicated four-part ABMS Maintenance of Certification® (MOC®) program in lieu of its simpler CPD program. Importantly, the newly required "Part IV" of the MOC® program involved completion of a "Practice Improvement Module" or "Patient Voice" component that included the collection of unscientific survey data from a physician's patients and their referring physicians. Practicing physicians were also changing from paper records to electronic medical records at this time and found this added requirement redundant, time-consuming and irrelevant to their practice and professional needs. While voiced opposition to this change in re-certification was made from the practicing physician community, it appeared to fall on deaf ears. In 2012, the process for "maintenance of certification" became "continuous." Because physicians now had to demonstrate participation in the MOC program every two years, and because they either had to pre-pay the full re-certification fee or pay a portion of it every two years, physicians became more active in their pushback against this change in policy that appeared to be driven more by finances than clinical value. A petition to change board re-certification quickly garnered nearly 23,000 signatures. "Regarding the 1989/1999 question - In 1999 ABIM Foundation became a separate operating foundation." As a result of this deflection, I have continued efforts to uncover the reason for the ABIM's date and location tax filing discrepancy. Shortly thereafter, the ABIM made immediate changes to their MOC program. Whether this announcement occurred because of the details outlined in my prior report, or because the ABIM realized their Part IV survey collection was to be required as part of the new physician payment reform legislation recently passed by Congress, or because these non-scientific surveys qualified as "research" for the organization's benefit and was in violation of federal statutes for the Protection of Human Subjects is unclear. 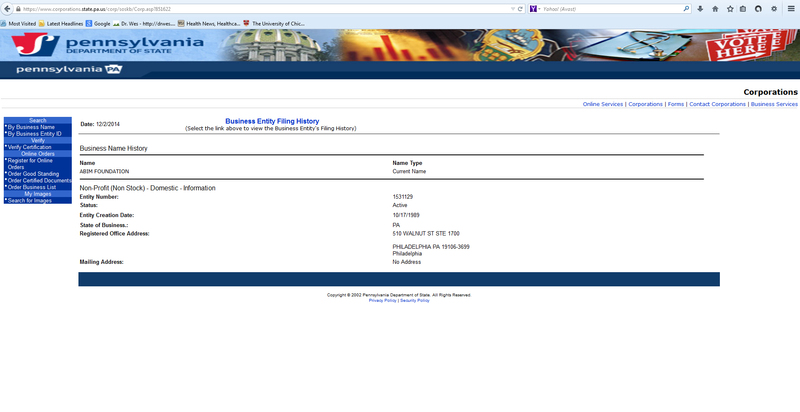 It is interesting to note, however, that the ABIM changed their domicile disclosure with the IRS from Iowa to Pennsylvania after my inquiry with their most recent 2014 Form 990. Such strong-arm tactics and secrecy have been integral to Board certification and re-certification. Such a policy immediately constructs an adversarial relationship between the ABIM and re-certifying physicians that infer intimidating dominance and power, rather than collegiality, over the test-taker. It also demonstrates the ABIM's ability to negatively affect a physician's ability to practice their trade in the event of failure and without a transparent explanation of the material missed. They also have no accountability for understanding a physician's practice circumstances. In fact, this clause was the basis of the ABIM sanctioning 139 physicians on the basis of "ethical violations" in 2010. In 1989, shortly after the decision was made to time-limit Board certificates, the ABIM Foundation (Foundation) was created. Tax forms before 2008 did not require the mission of the Foundation, its origination date, or domicile to be disclosed at the time. What was clear, however, was the Foundation shared the same address and had common officers with the ABIM in Pennsylvania. The Foundation is another tax-exempt 501(c)(3) organization that was granted its public charity status by the Internal Revenue Service (IRS) in 1990 as a Supporting Organization 509(a)(3) Type I. Other than tax filings, the existence of the Foundation before 1999 was never fully disclosed to the general public or US physicians. In fact, even the most recent tax filings of the organization continues to claim the Foundation was established in 1999. Despite this fact, it is clear that the ABIM Foundation had $46,247,684 (line 21) in "net assets or fund balances" by 30 June 1998. We also see "contributions" from the ABIM to its Foundation in the amounts of $4,580,000 in 1997 and $5,400,000 disclosed on the tax documents when the Foundation changed its accounting method from cash to accrual in the fiscal year 1998. Even the revised bylaws of the ABIM which were adopted October 6, 1998 (and included with the ABIM's Form 1998 Form 990), incorporated the "ABIM Foundation, a Pennsylvania non-profit organization," as the sole voting member of the ABIM Board as a corporate entity in Section 2-8. Hence, it is clear that the ABIM Foundation not only existed well before 1999, but was used to quietly funnel large amounts of money from the ABIM to their Foundation, much of it likely from the new-found wellspring of dollars earned from the re-certification requirement. I should mention that because I did not have access to tax data from 1990-1996, the number of financial transfers is unknown to me but the amount transferred was far greater than the $55 million mentioned by Dr. Wachter yesterday in his blog post. Importantly, these financial transactions establish that the ABIM Foundation was not a "supporting organization" for the ABIM, rather the ABIM was the supporting organization for the Foundation. Reviewing of the Internet Archive of ABIM webpages, the ABIM published its first "ABIM.org" webpage on the internet on or about 6 Jul 1997. There was no mention of the existence of the ABIM Foundation on their website at the time. (Interestingly, Harry Kimball, MD, then CEO of the ABIM, disclosed the existence of a "Foundation" when he mentioned its role in creating the (now defunct) Institute of Clinical Evaluation in an interview with the ACP Internist in 1997). It is possible non-internet-based communications were held with select individuals or organizations about the existence of the Foundation at the time. The first recorded appearance of the ABIM Foundation on the ABIM website as a "Liaison Organization" was on or about 4 Mar 2000. Likewise, the instance of the "abimfoundation.org" website recorded by the Internet Archive was 17 December 2000 and its appearance coincided with the ABIM Foundations "Medical Professionalism Project." It is no surprise then that most physicians and the public were completely unaware of the existence of the ABIM Foundation before the year 2000. Finally, the ABIM continues to deny the existence of the ABIM Foundation on their website and their most recent Form 990 tax form. Claiming this oversight was "just a clerical error" won't suffice because too many lives have been adversely affected as a result of their tactics. With the changes to re-certification that became increasingly onerous, the publications by authors from the ABIM were voluminous highlighted on the ABIM's "Journal Articles Authored by ABIM Staff and Leadership web page. No articles independent of ABIM staff show improved patient outcomes for board re-certifying physicians on their web page and when studied carefully, the median Medicare payments made to 150 authors for a portion of one year was $0, suggesting a significant disconnect between practicing physicians and the authors from the ABIM. Because many of these articles reside behind pay walls, critical review by practicing physicians without free academic journal access would have been expensive for most non-academic practicing physicians to conduct. Because financial conflicts of interest of the authors and the source of funds for the "Medical Professionalism in the New Millenium" paper published in The Lancet and The Annals of Internal Medicine in 2002 were never disclosed, a retraction of this paper in both journals should be considered by these journals' editors, or at the very least, a formal apology issued. 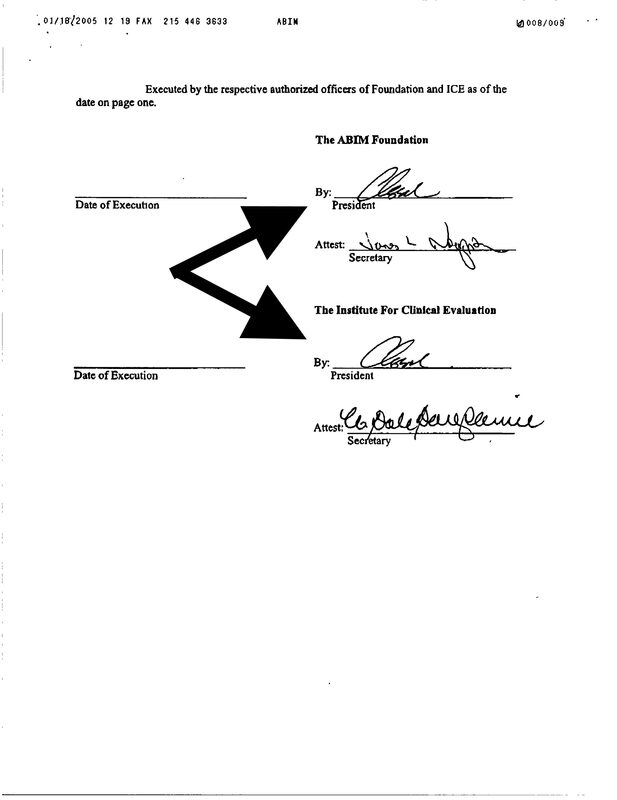 In light of the continued cover-up of the first ten years of existence of the ABIM Foundation and the financial transfers that occurred to the Foundation to the ABIM during that time, Board re-certification was never about "evidence that the knowledge and skills of practicing specialists decline with time." Instead, it appears board re-certification was about assembling a financial war chest for the ABIM and its Foundation for their own agendas and avarice. It is ironic, indeed, to think the ABIM Foundation's Medical Professionalism white paper published widely in 2002 that came from their own "Medical Professionalism Project" never considered its own agenda and source of funds as a severe violation of medical ethics, public trust, and their own "social justice" imperative. If we include the $46.2 million dollars accumulated by 20 June 1998 in the Foundation and add the other $30.66 million in "grants" made from the ABIM to their Foundation between 1998 and 2007 (as public record demonstrates), the ABIM Foundation's war chest of over $76.86 million can be accounted by ongoing siphoning of physician testing fees to the Foundation. The additional interest revenue earned from this money helped fund the high salaries of their officers and staff, expensive condominiums, spousal travel fees, and facilitated extra time off for posh consulting arrangements that earned several more hundred thousand dollars for their former President and CEO, as well as undisclosed fund amounts to any organization with a "cost-saving" idea who applies to the Foundation for grants. How Big is the Business of Board Re-certification? A total of 120,242 physicians re-certified with the ABIM from 2000-2014 (personal data obtained from published pass rates for these years). Current fees paid by physicians for the re-certification program are $1940 for internal medicine doctors and $2560 for subspecialists. Doctors with multiple sub-specialties must pay 100% of the most expensive specialty and 50% of the fee for the less expensive specialty examination. Therefore, for doctors re-certifying in one specialty, the fee to the ABIM is currently $1940, two specialties $3530 and for three specialties $4500. In 2000, those fees were $825 for one specialty, $1025 for two specialties, and $1225 for three specialties. Said another way, re-certification fees have increased 235% over 15 years for one specialty, 344% for two specialties, and 367% for three specialties. If we assume an average of these fees over the 15 years of testing, the costs each year would have averaged $1382.50 for one certificate, $2277.50 for two certificates and $2862.50 for three certificates. During this time frame, the ABIM earned on average somewhere between $166,234,565 (1 certificate: $1382.50 * 120,242) and $344,192,725 (3 certificates: $2862,50 * 120,242 physicians tested). Note that this number does not include repeat testing, re-scoring fees, extra certificate fees, prep-course fees, travel, time away from work, etc. Given the number of physicians who are now employees, this also represents a massive waste of funds by hospital systems who may pay these fees. I estimate re-certifying physicians have wasted close to a quarter of a billion dollars to the ABIM and their Foundation for this fifteen year period of time with no evidence participation in this program affects patient outcomes. 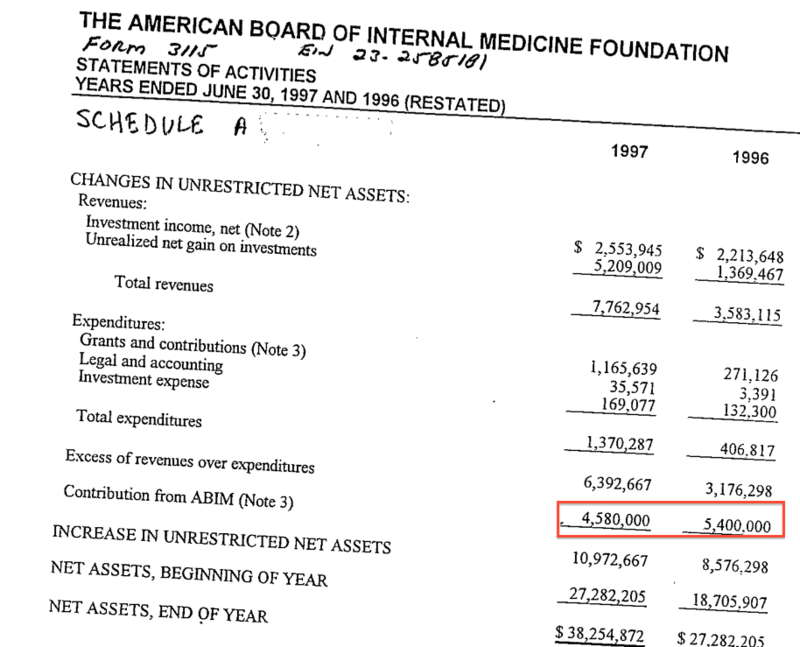 Given these revenues at its disposal, we should also question why the ABIM has allowed the organization to grow its deficit from negative $558,511 on 30 Jun 1998 to negative $47,866,654 as of 30 Jun 2014. To the best of my knowledge, the ABIM has never studied the socioeconomic and psychological effects on physicians that fail their re-certifying examination. With the potential to lose hospital credentials, severe consequences for failure on the secure examinations are a real threat to physicians' ability to practice their trade. Based on the ABIM's published pass rates for all specialties between 2000 and 2014, of the 120,242 physicians who took the ABIM's Board re-certification examination, I calculated (using the ABIM's own pass rates published each year) that 15,832 physicians (13.2%) failed. What impact did the failure of these physicians have on their ability to care of their patients? Why don't we know? Might the failure of these physicians adversely affected patient care? How many lost hours of work, anxiety, and frustration resulted? How many additional dollars were spent to sit for the next examination? How many repeat tests were performed by those who failed? How many physicians left medicine because of their failure? Sadly, it seems none of these critically important issues are of concern to the ABIM or the professional subspecialty groups who support the proprietary ABMS MOC® re-certification program. The American Board of Medical Specialties who holds the trademark for Maintenance of Certification® serves as a member board of the Accreditation Council for Graduate Medical Education (ACGME) and deserves responsibility for lobbying Congress to include their corrupt Maintenance of Certification credential in the Affordable Care Act as a physician quality registry. Other member boards of the ACGME include the American Medical Association, the American Hospital Association, the Association of American Medical Colleges, the Council on Medical Subspecialty Societies, the American Osteopathic Association, and the Association of Colleges of Osteopathic Medicine. It is incredibly sad to think that our youngest and brightest physicians currently have to enroll in the unproven and grossly corrupt ABMS MOC® program before they have even received their first certification from their respective subspecialty board. It is puzzling that the American Hospital Association (as a member of the ACGME) would support the inclusion of such a program for physician credentials given its 13.2% failure rate of this program. Don't hospitals need doctors, especially now that health care reform is providing an unprecedented influx of patients through their doors? Perhaps they are looking for a way to substitute cheaper nurse practitioners with less clinical training for the physicians who fail their MOC® examination? For patients and hospital administrators dealing with physician recruitment challenges, this remains an important question. The American Medical Association's role in the ABIM financial controversy has been fickle. On one hand the organization demonstrates an interest in practicing physicians' concerns, but is also supplying legal defense assistance to the ABMS who was sued by the American Association of Physicians and Surgeons in federal court for possible anti-trust violations relating to the MOC® program (the case is pending in Chicago). What is needed now is a good housecleaning and an open and honest dialog about the financial practices of the ABIM. Before that can occur, I believe all types of Board re-certification should end immediately and conventional Continuing Medical Education (CME) credits suffice as evidence for a physician's commitment to lifelong learning. In my opinion, hospitals and insurance companies whose policies require re-certification to remain credentialed or to receive insurance payments should drop this requirement or allow competing boards that use CME alone to suffice as evidence for ongoing educational efforts of the physician. Unless and until the unproven and potentially damaging practice of MOC® re-certification of physicians ends, our House of Medicine will remain irreparably divided between the bureaucratic non-clinical physician idealists and the practicing physician community. Such a path forward will be difficult due to the money involved and the entrenched status quo. However it is encouraging to see the Heart Rhythm Society recently take a leadership position in the re-evaluation and push-back to the status quo by exploring alternative pathways to the American Board of Medical Specialty's MOC® program. The American Association of Clinical Endocrinologists has also elected to abandon the ABIM Foundation's Choosing Wisely® campaign (funded almost entirely by physician testing fees) because the "AACE is concerned that the campaign's direction may lead to unintended consequences and drive a wedge between our members and their patients and become a barrier to open communication." Such moves show insight to the monetary conflicts that are increasingly being brought to light with the American Board of Medical Specialty's proprietary MOC® program, the ABIM, and the ABIM Foundation. Hopefully with this post I have shed a very bright light on the MOC® controversy and financial actions of the ABIM and its leadership regarding the origin and distribution of their Foundation's funds. I would encourage patients and doctors to send the evidence contained here to your elected representatives and hospital Medical Executive Committees. Investigative journalists are invited to fact check the statements made here. Likewise, I welcome responsible comments from members of the ABIM and the ABIM Foundation and other medical societies to dispute or better explain the findings I have made public here in the comments section of this blog. Too much money, time, and effort is being needlessly wasted by the proprietary, secretive, and unproven ABMS MOC® re-certification program that detracts from patient care. Physicians already have state licensure boards, hospital boards, the Drug Enforcement Agency, insurance companies, National Practitioner Data Bank, and the entire tort industry to oversee the appropriateness of our care. Re-certification is redundant and has never been proven to improve patient outcomes over our current system of physician continuing medical education. Still, because of the revenue payments required by the increasingly non-voluntary MOC® re-certification program, I believe that only a strong grassroots effort will end the unnecessary and burdensome program that has been foisted on physicians without clinical justification and may be deleterious to patient care, especially when we realize the untoward effects of this program have never been studied. As thousands if my colleagues know, I have devoted countless hours of time to this research and I take no joy in these findings. I do this because I love my profession and believe it is the finest profession in the world. It breaks my heart to see it exploited. This corruption has no place in medicine. Period. We must believe this in order to see it end. Thank you Wes for this succinct (and it is voluminous) summary of the fallacy of Board Certification and especially re-certification as anything more than a financial juggernaut supporting the ABIM and not patient safety or professionalism! Extortion is only professional in the "confidence industry"-whereby that is exactly what the ABIM is-an industry selling false confidence to hospitals and reportedly patients (who by the way have no idea what board certification even means). We need all physicians, who by nature are adept at critical thinking, to read and understand this situation and stand together to oppose it. There is strength in numbers. Until we all begin to speak out against this travesty to our employers, hospital MECs and insurance companies, nothing will change. We still have a voice. We just need to use it. HOORAY for this! Sure throws cold water in the face of that apologistic and utterly insulting piece by Bob Wachter. And invoking a comparison to the Arab Spring? What a joke! Maybe his next piece will include a reference to the Holocaust! "We have heard REPEATEDLY from diplomates through their feedback that MOST believe in the principles behind MOC – as both a process that supports physicians in their commitment to stay current in their fields, and as a credential that demonstrates to their peers and the public that they are staying current in knowledge and care." This is just unbelievable !! Dr. Baron , your credibility has now reached negative numbers. Dr Baron, when you LIE endlessly , you cant expect anyone to care what you say. "Maybe his next piece will include a reference to the Holocaust!" Well, he did accuse Dr. Wes of McCarthyism (which he apparently defines as "saying things that give me a sad") and claimed that defending the ABIM is a moral issue. Great article Dr. Wes - but it lacks a call to action. What do you need your readers to do? Who should they call or write to? What actions can be taken to put pressure on ABIM and the Government? In his defense, Dr Baron is obviously neither insane nor deaf, but in classic ABIM form, he has elevated the phrase "deliberately obtuse" to a new art form. In tortured ABIM-speak: Diplomates' consistent opinion regarding commitment and importance of life-long learning == "belief in MOC principles" == "overwhelming support of ABIM MOC process". 1) We have heard repeatedly from ABIM diplomates that the vast majority of physicians strongly voice their commitment to life-long learning as part of their individual responsibility as practicing physicians and further recognize that initial board certification was never intended to demonstrate competency for a lifetime of medical practice without need for continued learning. 2) We have also heard repeatedly from ABIM diplomates that the current MOC process has been widely rejected as demonstrating insufficient value in terms of tangible benefits to justify the direct and indirect costs required to participate in MOC, which includes but is not limited to training module cost, review course fees, and time away from practice and family, significantly exceeding the direct cost of MOC fees payable to ABIM. 3)Physicians participating in ABIM MOC have never demonstrated improved outcomes in terms of safety, reduced length of hospital stay, decreased cost or any other objective measure in any credible peer-reviewed research published, which excludes results funded and published by ABIM, in comparison with physicians who do not participate in MOC. 4)ABIM diplomates have multiple options available to demonstrate their commitment to stay current in their fields such as alternative board certification and participation in ACCME-accredited CME in addition to MOC, with the goal of communicating to their peers and the public that they are staying current in knowledge and care, but only a small fraction of practicing physicians would voluntarily select the ABIM MOC process if they weren't faced with loss of employment, insurance panel participation or hospital staff privileges by refusing to participate in MOC. See, wasn't that easier, Dr. Baron? Of course, if I'm off-base on any of the above, I would welcome your correction with appropriate references to back up your position. Great article. How can this material reach the ABIM? 1. I signed the anti MOC petition and pledge of non compliance. 2. I forwarded anti MOC emails to every possible physician. 3. I wrote to Richard Baron 3 times freely expressing my opinion on how MOC is useless, a waste of time and how is affecting the medical community, families, patients, etc. 4. I called the ABIM, cancelled my MOC and requested a refund for my money. 5. I wrote to the President and Vice President of the ACP to express my opinion as stated above about MOC and told them I'm not renewing my ACP membership as a sign of protest against ABIM MOC and asking them to represent the medical community and do something about it. 6. I got certified by the NBPAS. 7. I sent the template letter they offer in the NBPAS website for considering the NBPAS as a certification alternative to 11 different payers/insurance companies, my state medical board, and credentialing committees of the 3 different places where I work. A BIG PART OF THE SOLUTION IS MASSIVE NON COMPLIANCE. WHAT WOULD INSURANCES, PAYERS, STATE BOARDS, ABIM, ETC., DO IF EVERYONE REFUSES TO PARTICIPATE IN SOMETHING AS CORRUPT, ABUSIVE AND IRRELEVANT AS THE ABIM MOC? IT'S LIMITED WHAT YOU CAN DO AT A PERSONAL LEVEL UNLESS EVERYONE IS ON BOARD WITH NON COMPLIANCE AND PRESSING FOR CHANGE, OTHERWISE THE ABIM WILL KEEP ABUSING US AND DESTROYING OUR PROFESSION. I HOPE THAT THOSE OUT THERE IN A BETTER OR MORE POWERFUL POSITION WITH FARTHER REACH DO SOMETHING ABOUT THIS. The ABIM, Richard Baron and his personnel are out of control, unethical and corrupt. This has to stop and they should be hold accountable for their action and the damage that they have done. This policy will not change the requirements for initial certification in these subspecialties. Physicians still need to be certified in a foundational discipline in order to initially certify in a subspecialty. Congrats on this ' backgrounder ' and analysis !! Obviously a ton of work ! I do hope physicians ( somewhat their fault sitting in the sidelines over the years ,,, ie : this example , as well as , obamacare ) move to action !! And, hospitals and clinics , to,support them !! There are two levels of response by the that will be triggered by this sort of reporting. On one level, the high road response. That's the kumbaya and bone toss we just saw from Philly, magnanimously giving an inch. One the other level, there's Beltway response. A phone call to a PR firm, who then calls a media gossip or political reporter (who probably doesn't know physician credentialing from brioche) and suddenly there's a damning piece of spin on the messenger and the message. It's just business. we probably have the same issues with. The ABFM . The ABIM was intended to last for no more than 50 years just to bring more order and opportunity into the practice of medicine and to help distinguish American and Canadian physicians who did not go to a top medical school. Certification was voluntary and did not have any implications for employability or privileges. Maybe Walt would tell us if he were alive today that the certification process is no longer needed in our already severely regulated world. After all, Bierring was opposed to burdening physicians with useless and continuous bureaucratic exercises, such as the contemporary ABIM attempts to impose today. Don't you think it is time to bring back the spirit of Walter Bierring into physicians’ lives today and with his strength and honesty of spirit reform the ABIM back into the non-profit humanitarian organization it was intended to be? Walter Bierring, MD, as former public health commissioner of Iowa, would be very disappointed in the executives, board members and new council at the ABIM who have corrupted the organization and deviated from the original purpose altogether. Uncle Walt would be emotionally sickened to see that the ABIM has been kept going for personal monetary gain. And he would be most disheartened to see the way the organization has not been transparent about the motives of the executive elites' with their political and corporate conflicts of interest. Page 2. Walter Bierring lost a leg in his early life. It did not stop him from achieving great things in medicine and being a great example for us all. If Walt were alive he might tell you what you can to do to change things. As a religious man and a very sincere and honest many he might say to you, "If your leg offends you, cut it off, lest your whole body might perish." So with Walt and for all of you, I echo a similar strong sentiment. Cut this evil that persists at the ABIM out of your lives. Sever the relationship and seek by whatever means is available, through legal power, governmental review, and by your own reasonable and moral persuasion to restore the proper order and balance to the ABIM and to your precious lives. The time you need for self, family and patient is yours. It is YOUR LIFE. It does not belong to any corrupted organization. Free yourselves and change the organization or perish with it. Words to the ABIM and ABIM Foundation: Cut off the ‘bad leg’ that will kill your organization and with it every physician that you have certified. It is time to go back to a not-for-profit ‘club’ with a lifetime certification; or dissolve the organization and give the money to universities to create a certification process producing a voluntary certification test for life. Bequeath the money to institutions who will act in a humanitarian spirit with people not conflicted as the ABIM’s executives have become. At universities there are strict rules about coi. Make it a free certification test or at little cost. Physicians' accounts have already been harvested repeatedly, so they owe nothing more. There is enough money in the ABIM’s accounts for this simple purpose. Voluntary testing could be operated off of current investments and vetted donors. It could be part of a knowledge bank available 24/7 in this new digital age. The time to act is now. Not tomorrow. Or you will be sleepy angry slaves again tomorrow and the rest of your life. Good luck. Link to the deficiency report on ABIM's auditor below. Unfortunately, most doctors are too afraid to speak publicly against any medical regulatory organization, no matter how questionable. Change probably will not happen until more doctors follow Dr. Wes's example and speak publicly. It enrages me that ABIM's dynastic lineage of professional medical politicians "pulled a fast one" on everyone with their clever invention of MOC. I find it outrageous that physicians, who are ultimately the intelligent trusted decision makers in medical care, were unwittingly duped in a scam designed to further hidden "political agendas". This dynastic lineage worked their political magic while on the job at the ABIM controlling their physicans, not serving them. Easy cash and loose time written into the perfect executive contract allowed an unelected body of a skillfully manpipulative medical politicians like Benson, Kimbal, Cassel and Baron to zealously alter the course of medical history by digging their spurs deep into the backbones of hardworking physicians; men and women who have sacrificed their lives in trying to make a difference in people's lives where it matters most; in a real exchange with patients providing meaningful effective care. Poltically motivated bureaucrats at the ABIM have been trying to alter that ancient sacred trust by playing with medicine in the name of politics. I think it should be clear now. It never was about social justice. Only in name. It was and still is all aobut corporate and government's interests. While acting like demiurges, ABIM's succession of gods, each with their own autocratic style of leadership steered the medical ship toward shores that favored not the patient, but the bottom line of corporations and governments' need to cut costs. MOC was a means and is now a deflection from seeing the real aims. Any trust in these political elites and their social causes has vanished in a wrecking ball of unrelenting self-destructive and irresponsible financial behavior. Lying to the theoretical statistical patient they never cared one bit about, and misleading physicians with financial mistatements and a blunder of errors in judgement that has caused the present sturcture of bureaucratic medicine to unravel at its "seamless" seams. Furthermore, this politically motivated clan at the ABIM foolishly lost control of their ambitions when they got too greedy in an attempt to seize the political moment. That was their fatal mistake. To want too much too soon. What was their means to help them achieve their political desires? A "war chest" of money filled with fast cash of the 1990's irresponsibly invested in the era of irrational exuberance. They put the money to work in a well established firm established in 1838, which ended up losing too much of their clients' money in too much specualtive investing. The financial bubble, when it burst, crushed the ABIM's risky portfolio, and the investment firm they used quietly died without any posssibility of being revived with assets at a fraction of what they started with. Clients lost trust. Loss of trust and greed killed them. And that is how and when the ABIM began to sow the seeds of mistrust. In hidden and risky dealings with physicians hard-earned cash. For what? Political agenda for social equality while they lived in the lifestyles of royalty, the rich and famous far removed from "We the People." It was and still is utter hypocrisy. I believed in them. Now the ABIM and even the ABMS have become themselves the victims of the unintended consequences of their self-serving desires and actions. An empire of political power now just tainted images of greedy administrators out of touch; and a breech of trust forever among physicians who have now the intimate knowledge of the facts. Cassell and her hard-working mentors and successors went too far. They took a wrecking ball to their image and public trust. And with that intimate knowledge of facts trust in the ABIM and ABMS are in a near freefall. It was not any reproter or reporting that brought them down. They did it to themselves. If ever there was a "conspiracy of fools" this is it. Many of the noble causes and good people which I have supported over decades have come crashing down on me. Truth can make you miserable at first, but it is a necessary part of a process to heal and move forward. Where do we go from here? That is the debate that every person in America should be having. Damage control will not bring back a fallen tower that has crushed beneath its weight so many precious lives. I will not let it crush anyone anymore. Whether MOC or Choosing Wisely, lives have been and are being destroyed in the name of "social justice", which is only a political veil for greed. Let's end all our wars and put the money to work for people who really need it. The patient. Is it too late to get it right? Stop counting beans and let the people count.